Sixteen Months in Dominica: One wicked storm. Tonight there's a mad thunderstorm outside. We think it's off to the west, over the ocean, but it's lighting up the sky over the island. We're going to post this quick, lest we lose power. 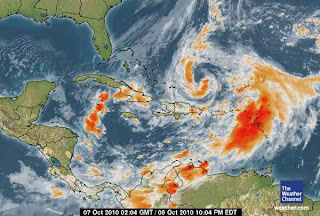 See that big angry red swirl? We're near the bottom right. We took a video, and managed to catch a wicked lightning bolt. Enjoy. PS. Anyone who can tell me how to link videos directly onto our blog gets brownie points. Sweet video - you can post them directly onto your blog by clicking the "share" button on youtube, below the video. Click on "blogger", and it will create the video in a draft post. Or, you can updload directly onto blogger by clikcing the little camera icon next to the picture icon. Or you can click the button on youtube and choose the color frame you want, and what size (i use 400pixels), copy the code, and then paste it into your blog wherever you want it to appear!